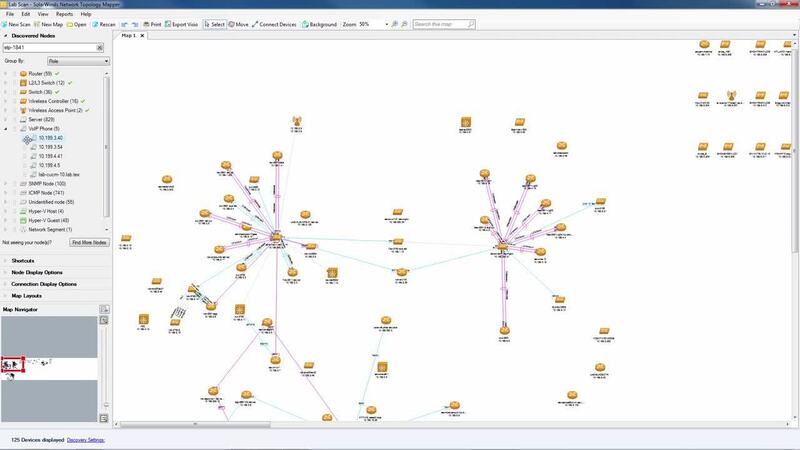 Find out why top IT professionals use SolarWinds® Network Topology Mapper software. Automatically discovers and delineates network topology and produces comprehensive, easy-to-view network diagrams. Supports multiple discovery methods including SNMP v1-v3, ICMP, WMI, CDP, VMware, Hyper-V, and more. Exports to Microsoft Office Visio, PDF, and PNG formats, and also schedules updated map export to Orion® Network Atlas. Network topology mapper software can provide reports on switch ports, VLANs, subnets, and inventory. Directly address PCI compliance, FIPS 140-2, and others that require maintenance of an up-to-date network diagram. Automatically discover network topology using ICMP, SNMP, WMI, CDP, VMware, Microsoft Hyper-V, and more. Automatically discover your entire network and create comprehensive, detailed network topology maps. You can also edit node details of map objects and connect network devices manually. Build many maps without having to re-scan beforehand. Capable of building loads of useful network maps without having to rescan using network topology mapping software. Save valuable resources, bandwidth, and time. Save time on documentation by exporting to Microsoft Office Visio, Orion® Network Atlas, PDF and PNG formats. Export network maps to Microsoft Office Visio, PDF, and PNG formats, and also schedule updated map exports to Orion® Network Atlas. Automatically scan for new devices, changes and unknown systems to ensure an accurate, up-to-date record of your network. Keep your network up to date by automatically detecting new devices and changes to network topology with scheduled network scanning in the network topology tool. Leverage multiple network discovery methods, including ICMP, SNMP, WMI, CDP, VMware, Microsoft Hyper-V and more. Perform multi-level network discovery to produce an integrated OSI Layer 2 and Layer 3 network map that includes detailed device information. Use network maps to help meet compliance requirements for PCI, SOX, HIPAA and FIPS 140-2. Directly address PCI compliance and other regulations that require maintenance of an up-to-date network diagram. SolarWinds network topology software is also FIPS 140-2 compliant. Perform network inventory management of hardware assets, and automate report creation. Save time, increase productivity, and obtain reliable device data by performing inventory management of hardware assets and automating report creation. Create detailed reports to track hardware inventory, switch port data, VLANs and subnets, and device ARP cache. Take advantage of robust reporting tools, which help you keep track of inventory and network information. Manage the size and placement of your icons and surround text. Advanced icon alignment and arbitrary text placement designed to let you resize and move icons and the text around them using the network topology tool. Features Overview Find out why top IT professionals use SolarWinds® Network Topology Mapper software. Where can I find information on installation and customization for my NTM product? Does SolarWinds offer training or certification for the NTM product? Our New to NTM section was created using customer feedback and contains videos, guides, and articles that will help you be more successful with your installation and customization. The NTM Training section is a single location where you can find e-learning and video classes that will take you from the basics through optimization. We allow you to browse classes or, if you prefer, follow customized learning paths to keep you on the right track. What is network topology software? Network topology software can help you scan and map your IT infrastructure, including network devices, servers, virtualization hosts, and anything else that responds to a variety of discovery techniques.